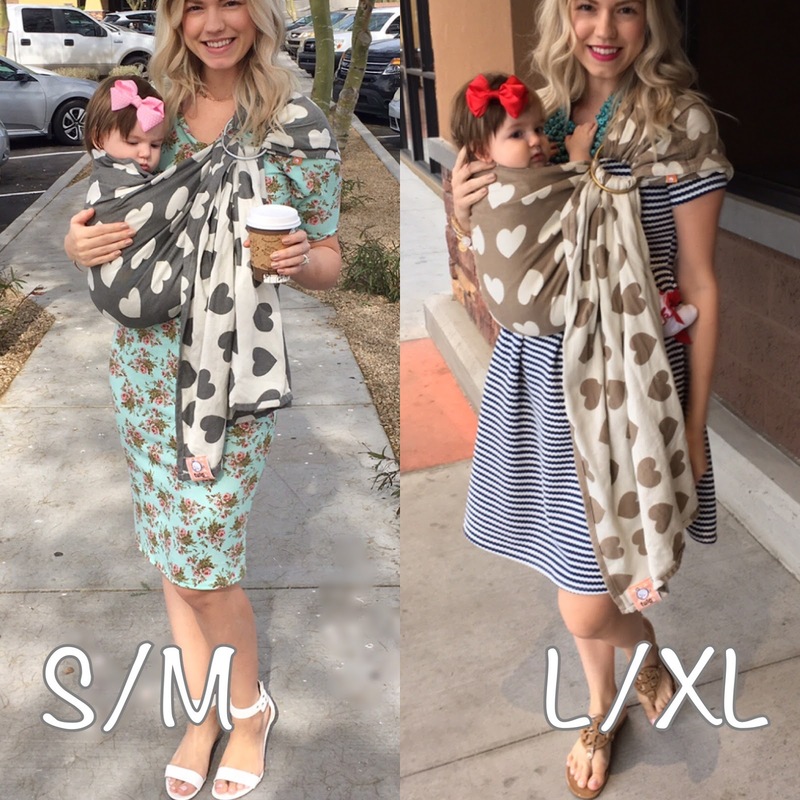 If you’re anything like I was as a new mom, you don’t know A THING about ring slings or woven wraps or soft structured carriers. My hope is that this babywearing series on my blog can help demystify what these things are and teach you how you can use them. I’ve already said this before but babywearing has made me a better mom, hands down. If I had a penny for every time I heard a mom say “I’m too scared to try ring slings, I’m afraid baby is going to fall out of the bottom!” I would be soooo rich, you guys. The truth is – ring slings are so majorly safe. 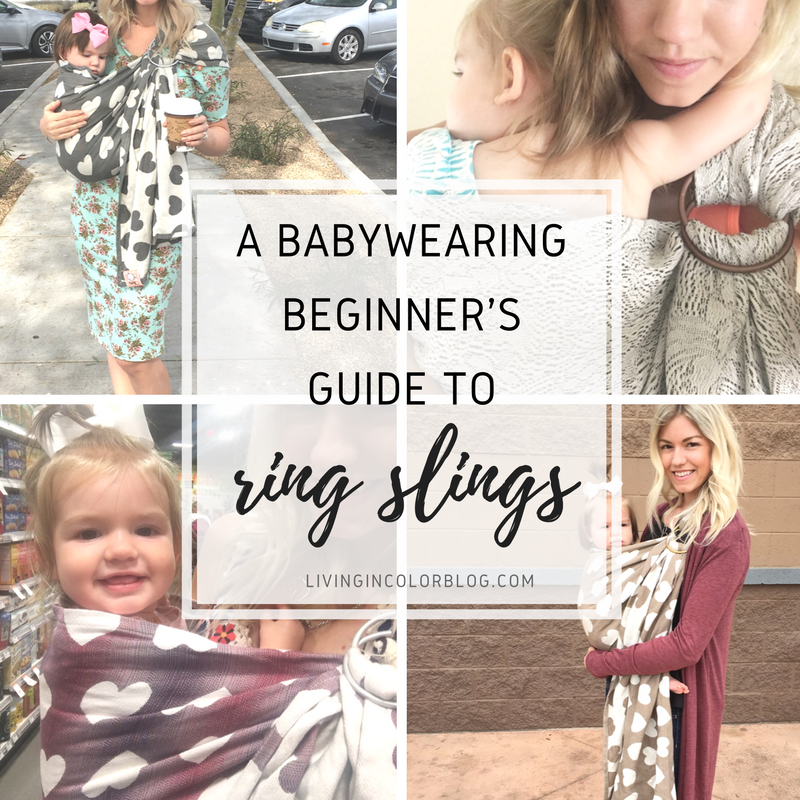 I’m super excited to write about all things ring slings in this post, so keep reading! A ring sling is a piece of woven wrap cut to a specific length (depending on size) and sewn at the shoulder with rings to create a convenient “ring sling” to use to wear a baby. So chances are when you receive your sling it will be unthreaded, meaning hte rings will be up top and the end of the sling will hang freely. The first thing you need to do is thread the rings. See this video that helped me when I was learning how to thread. After your sling is threaded, you are now ready to experiment with how to use it. Basically the rings do hold the wrap in a way that your baby can’t fall out. Because of the specific way you create a seat, wrap around your baby and then tighten carefully. Read on for tips on using a ring sling! Who needs a ring sling? Anyone who wants to wear a newborn often (these are the easiest to use with newborns, in my opinion). Also, anyone who wants to run a quick errand, or someone who has a baby or toddler that need to be carried/worn in a hip carry. See, I look at it this way…You have to carry your baby or child on your hip anyway, right? Why not have a nice and supportive piece of fabric to help you do it? Is a ring sling the only carrier I need for my baby? Yes and no. If you have a newborn or super light baby, then yes, all you need is a ring sling. At around six months I started wearing G in her soft structured carriers too since they help distribute weight a bit better for older babies. But I still use my ring slings too – just for different reasons! I use three types of carriers daily. A ring sling, woven wrap, and soft structured carrier. They each have different functions and you can read more about that in this post here. But we’ll stick to ring slings since that’s the focus of this post! How old does baby have to be to be worn in a ring sling? Each sling has it’s own weight limit depending on the fabric and the age of the child. Generally, 35 pounds is a good maximum baseline. You can generally wear a newborn in a ring sling right away (assuming there are no medical problems – be sure to consult a medical professional before officially wearing your newborn in a sling – just to be safe.) I wear my 17-month-old in a ring sling daily and still feel very comfortable with her in it. She love it so much. What are your favorite ring slings, Larissa? I have owned quite a few ring slings in several different types of material. Baby Tula tencel blend ring slings are my favorite fabric/types because of their cute prints and their special tencel material they use. Of the four that currently live here now, three of them are Tula. The other is a Pavo converted ring sling converted by a seamstress (she sewed on the rings of the piece of woven wrap I sent her) because I wanted that to be a custom! I love it so much. I’ve also heard good things about Sakura Bloom but have never felt the need to try them because I’m so content with my Tula wovens. I have a few linen and chambray Wildbird slings as well, and they’re pretty great. Here’s the thing – when I bought my first sling I had people tell me to get a S/M (small/medium) because that’s what t-shirt size I wear, but I prefer a L/XL (large/extra-large) aka, LOOOOONG tails! I love the long tails because they serve three purposes: the first is beautiful flowy fabric, the second is a makeshift nursing cover, and the third is extra support at neck or bum or another layer of warmth for baby! It’s a win-win with longer tails, but honestly it’s a personal preference thing! My size guide in the image below is for Tula Baby Carriers sizes. For ring slings that are converted from small pieces of woven wrap, just look at the inches and then refer back to this guide. Most slings are around 2 meters give or take. My Pavo ring sling (the lace looking one in the last photo of this post) is a bit shorter, measuring around 79-80 inches. I would love it more if it were longer, but it’d be great for a newborn. 1. Create a deep seat. This. This is why ring slings aren’t dangerous and why I think it’s so silly when people worry that “baby might fall out” haha. It’s virtually impossible if the ring sling is positioned and worn correctly! Check out the photos of G in her ring slings. The bottom “rail” (that’s the edge of the fabric) is pulled all the way up to her belly button and underneath her bum, and she’s supported knee to knee that way! You can’t see it, but she’s super safe and comfy in there. 2. Make sure positioning is correct. The graphic below shows optimal comfort and tips for using ring slings, but it’s important that baby’s knees and bum form an ‘M’ shape, meaning bum is lower than knees. This helps with a good seat, and also ensures comfort for mom and baby! 3. Wear your baby opposite of your “good side” and make sure there are no twists in fabric on your back. So, this is a tough one, and may actually be personal preference. I say wear baby on opposite of your good size, because that’s how you can have full motion in your good arm (the one you use most). However, I am right-handed and wear my baby on my right side, meaning the rings are on my left shoulder. It’s another personal preference thing, so try both ways and see what’s most comfortable for you. Remember, just because you aren’t being worn doesn’t mean you shouldn’t be comfy too. The fabric that goes across your back should be flat and snug on your back so that it doesn’t mess with the seat or the fabric that’s threaded through the rings. 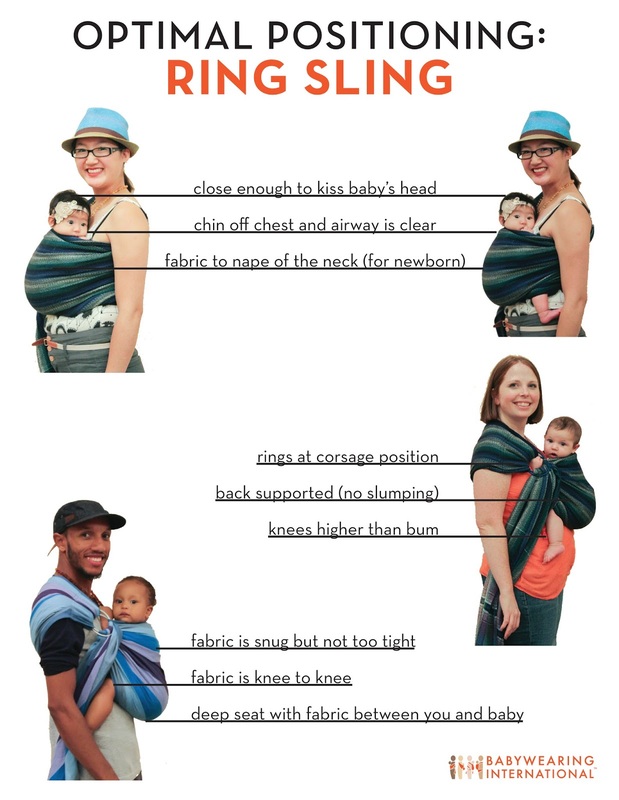 For a comprehensive list of tips and FAQ’s visit Tula’s ring sling resource page. Bonus tip: Be patient and take your time with learning. You WILL get frustrated, but I can also promise that with practice and determination, you will get good at it. And although there is a bit of a learning curve, you’ll be doing it all on your own in a matter of seconds! Be confident! Watch YouTube videos. Tula offers amazing instructional resources on how to use your ring slings. Be sure to check out my other babywearing posts. Happy babywearing! « How To Style Hunter Boots + Hunter Boots Giveaway! I am definitely going to save this post for down the road! I always wondered how all the mama's wrapped these things! Loved this post! I just got one and so excited to use ours! Such a great guide for all the mama's out there! This is such an awesome guide!!! I will have to show this to my cousin! This is such a great post b/c I had the hardest time learning how to use one with my girls! I love the fun patterns the slings come in! This would be a great gift for my mama to be friends! This is so helpful! I'm expecting a baby girl in January and I need all of the tips I can get! Love the fun patterns of these too! I am definitely bookmarking those post for when I have a child! Thanks for sharing! You and your little girl look so precious in these pictures! These look so cool! Definitely getting one when I get a baby!